DebsHere: Guy and Eva Bijoux Blitz Sale-Day 4! Guy and Eva Bijoux Blitz Sale-Day 4! 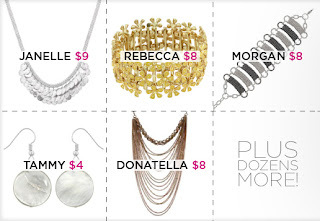 All of these gorgeous pieces are up to 80% off.Check these deals and more right here. But~you better hurry as each deal is only good for one day! This is a great time to add to your wardrobe! Stay tuned as I will be updating as the Sale continues so you can get in on the deals each day!